Hey guys! So I was hoping to change the sound pack for the server I run with a buddy. Sound is a BIG factor in entertainment to me, and the guns in Overwatch sound good, but after hearing the Jsrs pack, I would REALLY like to upgrade our sounds. Are there any new (usable) sound packs for Overwatch? And if so, can this be applied server side in any way? Next question. I would like to have our debug menu's color changed, and in addition, made a bit translucent. Are those 2 things possible? Having the background is good to help distinguish while reading it, but being see through will help with game play. then it would not matter if a player had it installed or not, they would still be able to join and play normally. It would be a 'special feature' that they can download and install. GOOD IDEA! I had actually run a server where we had a bunch of custom addons (like the SoW, electrical grid etc) but we let everyone join. If they didnt have the mod installed then they could still join and play but the experience was better when they went to the website and installed our mod. You cannot change the color of the debug monitor because its a Hint box which is only brown, as far as I know. I have been toying with the idea of creating exactly what you say, a dialog box that is customizable to any color or even transparent. I made a quick and dirty kill message box in the upper left that was like that. Could easily move it to the upper right and change the variables. that is the Sounds of War in Overwatch http://www.armaholic.com/page.php?id=6901 which sounds pretty good. Quick debug menu .. Just an example to show .... Only put 3 lines of basic data in it. One problem with this version I have here is that it does not support 'structured text' such as fonts and colors. So the text will be one color. BUT .. I used a standard Text Box, we could use a different control which does support structured text. I made the background black with 60% transparency. It could be any color, any shade, any size or totally transparent just showing the text (any color text of course). I am not completely knowledgable about creating dialogs so its possible that things can be done with this that I am not aware of or able to do. When you press INSERT, this will be displayed. 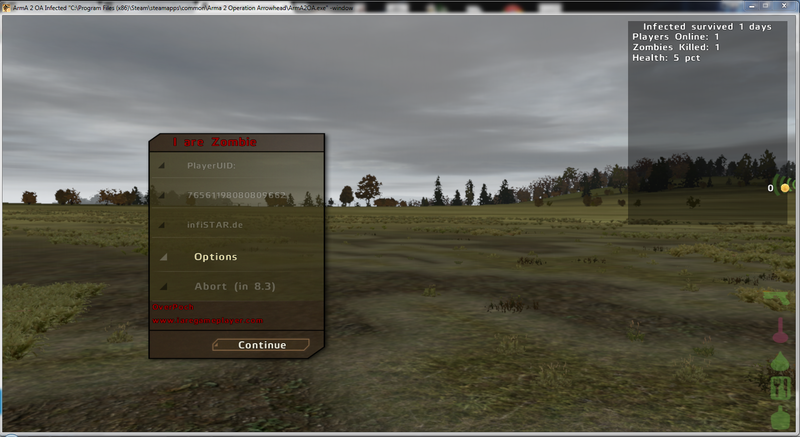 You only need the bikey's for JSRS, Blastcore, etc in the server "keys" folder to enable those mods. Then, if a client wants to use JSRS all he has to do is download it. If he doesn't have JSRS/Blastcore he can still join and play, and then you don't need to to set verifySignatures = 0; which I think is a bad idea. good to know. i was not aware you could do that with just the keys. then the mod is installed client side only? i agree verifysignatures 0 is probably a bad idea but thought that was the only option. Yeah, JSRS, Blastcore, WarFX, etc are all client side. There is one file for JSRS concerning road noise (fn_surfaceNoise.sqf) that you need to implement otherwise your server.rpt gets filled with spam however. You guys just gave me a headache, lol! Yeah, I'm new to coding. I'm more the builder on our server, so work in the 3D editor is where I shine, lol! We will mess around with those and hit you up for any questions.